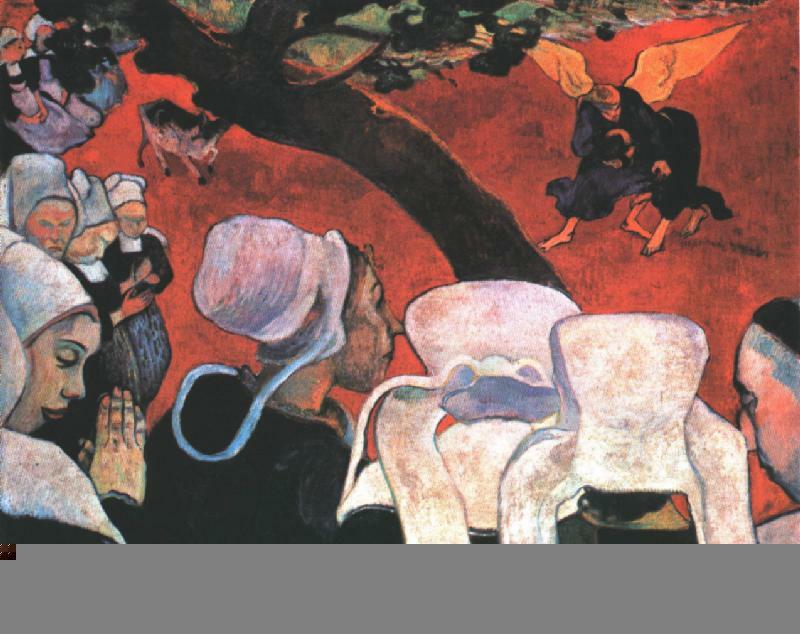 Paul Gaugin, "The Vision After the Sermon: Jacob Wrestling with the Angel"
Today's sermon has its origin in numerous conversations through the years that members have initiated with me about my struggles with Christian belief. Puzzlement and concern were expressed. Forced to reflect on my personal spiritual journey, I discovered myself to be a "bottom-up thinker," a discovery that required far more self exploration and self reflection than I anticipated. The result has been a journey of personal discovery which I appreciate only on this side of the process. If a child in first grade clearly shows herself or himself to be left-handed, do we force that child to write right-handed? No, not today anyway. But not too long ago, we did. My father-in-law was ambidextrous because, as a lefthanded child, he was forced to learn to write with his right hand. when we see a person write with the left hand upside down, we know he or she had to learn on a desk made for a right handed person; when we say a person is someone's "right hand man," we know that individual is an important person; when we say a person received a "lefthanded compliment," we know the compliment was not straightforward; and when we Christians unite in the Nicene Creed we declare that Jesus sits on "the right hand of God the Father Almighty." All of those expressions come out of a time when left-handedness was not just different but wrong and dangerous. Of course, today, we would not force right hand writing on a left-handed child; today, left-handedness is a human difference and not a moral failure. In the process of my personal exploration, I discovered another difference which I believe to be basic in humans, a difference between those who approach life with a deductive mind set and those who approach it with an inductive mind set. inductive thinking begins with specific experiences or observations and then `inducts' a generalized principle, but a principle that is always under question. Often this is seen as the difference between scientific and nonscientific thinking, and it is true that the scientific method requires inductive thinking. But, I believe that most people involved in science and technology are deductive thinkers who have learned inductive thinking for their work. For example, we all know the speed of light not because we all have carried out the experiment for ourselves but through the authority of others. Inductive thinking is a process which can be learned, just as lefthanded persons can learn to write with their right hand. I have come to believe that a deductive mind set is as common as right handedness, and that the inductive pattern of mind functioning is found in a minority of humans, as is left handedness. As part of that inductive minority, I have great empathy for the lefties who have to conform to a right-handed world. Inductive thinking is bottom up thinking. How does a bottom up inductive thinker operate in the pervasively deductive world of religion? With great difficulty! It is important to note that an inductive person is not a skeptic. My experience of skeptics is that they really like to debunk the beliefs of others, whereas, an inductive, bottom up thinker questions in order to get at the source of meaning. and the firmament shows forth the work of your hands. and night brings the message to night. their words to the farthest bounds of the world. The Apostle Paul, although a deductive thinker, articulates in Romans an inductive approach as he attempts to argue that all humans are under the judgment of God. To do this, he postulates that God can be known through experience. From heaven God shows how angry God is with all the wicked and evil things that sinful people do to crush the truth. They know everything that can be known about God, because God has shown it all to them. God's eternal power and character cannot be seen. But from the beginning off creation, God has shown what these are like by all he has made. That's why those people don't have any excuse. They know about God, but they don't honor him or even thank him. Their thoughts are useless, and their stupid minds are in the dark. They claim to be wise, but they are fools. They don't worship the glorious and eternal God, instead, they worship idols that are made to look like humans who cannot live forever, and like birds, animals, and reptiles. Normal religion is so pervasively deductive. Truth flows from authority downward. Truth resides in a book, or in a person, or in a creed, or in a particular theology. Thus, we hear people say. Preaching must begin with the Bible. As an inductive thinker, I find it impossible to begin with assumed truth. For example, when people say, "The Bible says ," unless it is a factual statement, I often begin to mentally squirm. Partly that is due to the outlandish things I have heard people say as they finish that sentence, and partly it is due to my constant question: what do we of the twentieth century urban, scientific, industrialized and western truly understand about a first century, nomadic to agrarian, prescientific, non-industrialized, and eastern culture. To automatically assume an equivalency of words, or feelings, seems to me absurd. Having lived in the Middle East for five years and as a Christian who takes seriously the Bible and tradition, I constantly struggle with the issue of the relationship of cultures. For example, for a people whose main experience of lambs is in pictures on a Sunday school wall, how are we to understand passages about sheep and shepherds made in a culture that relies on sheep for its very food and fabric? Inductively, what I am compelled to do is to find, for myself, the connection between text and reader at the only point I find possible: our common human experience. From such human experience, the ancients articulated the deeper religious meanings of their own experience. In the Bible, we listen in on their conversation and draw from them their insights and wisdom. When faithfully done, I believe it is possible to make a vital connection with the biblical text. Thus, my questioning about religion goes back even further than the Bible text. It goes back to the human experiences that informed the text, delineating the religious impulse itself. I ask why religion is such a persistent and pervasive human activity. I remember once attending a party of professors and graduate students of the anthropology department of a local university. One student was in an argumentative mood as he pushed me to justify Christianity as the right religion. He asserted that Christianity could not, of course, be right since there are so many different religions in different cultures. Having been on that futile track so many times, I shifted the conversation and asked him if anthropologists had found any societies that did not have a formal religion. He admitted that he knew of none. I then asked him whether or not he was part of a church or synagogue. He said, "No." I then asked, "If all societies have a religions, even if different, and you have chosen not to be part of a religion, then why have you decided to drop out of the human race?" The rest of the evening, he sought out more interesting company. Although that individual thought of himself as a modern thinker, he was mired in deductive thinking. Having predetermined what religion was like, he now applied it to all individual expressions of religion, closing himself to new thoughts. There is the phrase, washed in the blood of the lamb, referring, of course, to the benefits derive from the death of Jesus, namely the forgiveness of sins. I do not use that phrase. Yet, it is a phrase that has its place in Christian tradition. So, I seek out its meaning in human experience, and I find there to be a perfectly reasonable meaning. There is a red bloodline that runs through all of history. This is not just a religious truth. We are awash in blood. Our very existence as a country was purchased in blood. The end of slavery soaked the earth with blood. The freedoms we have, such as freedom of the press, were wrested in the blood of a number of individuals who gave their lives for that freedom. Thus, it makes perfect sense to me to speak, as a Christian, of being "washed in the blood of the lamb." The word faith does not describe a set of beliefs but is the way we talk about how we and all humans lean into life. Driving down the road, allowing children to go to the mall, and committing oneself to a Christian community are just a few of the innumerable ways the word faith articulates our life's journey. I believe the Apostle Paul was right when he wrote that life's great abiding realities are faith, hope and love. Faith describes the way we approach life; hope picks up all of that which pulls us into the future, and love is the way we have come to understand, because of Jesus, the most human and humane way we can live. Words are the way we infuse human experience with understanding and meaning. Once words are created then there is a tendency to make life conform to our words. Far too often, `holy' words are used to impose structures on human experience (a deductive approach). What that happens, I feel my spirit squeezed. My particular religious struggle is not your struggle nor is it the struggle of my fellow religious professionals. Religious belief, for me, is never a given. It is a struggle to articulate the movement of the Spirit. I find myself sympathetic with these words from the Spanish philosopher, Unamuno. I shall be asked, "What is your religion?" and I shall answer that my religion is to see truth in life and life in truth, conscious that I shall not find them while I live; my religion is to struggle tirelessly and incessantly with the unknown. My religion is to struggle with God as they say Jacob did from earliest dawn until nightfall. I shall not admit that Unknowable and the Unrecognizable of which pedants write, nor say, "beyond this thou shalt not pass." I reject any eternal ignoramity. In any event I wish to reach the inaccessible. One final word. I want to express the depth of my appreciation to you, the members of this community. My experience in the church at large is that bottom up thinking is treated like society once treated left handedness or people with the pox, exerting pressure to conform and dismissing those who do not. I have deep appreciation for your willingness to be active participants in this ongoing conversation.